Old Glory flapped in the breeze outside American Legion Hall 263 near Baltimore Sunday as a group of black veterans and their relatives gathered inside to enjoy America’s game. The Baltimore Ravens were getting roasted by the Jacksonville Jaguars on television, but much of the talk was about the groundswell of national anthem protests triggered by President Donald Trump’s angry outburst denouncing them. Dozens of Ravens and Jaguar players took a knee in defiance of Trump, and many others stood on the sidelines locking arms in a show of support. Smith is proud of his military service and proud of his imperfect country. Truth be told, he was ambivalent about the NFL players who took a knee or raised a fist during the national anthem. But once Trump weighed in — calling on NFL owners who see players “disrespecting the flag” to “get that son of a b—- off the field right now” — Smith felt disgust, not solidarity, with the commander in chief. Many of the Legionnaires and their family members voiced similar sentiments as they came to the hall for an afternoon of football as they do every Sunday during the NFL season. On one hand, they know better than most the sacrifice of military service. They also believe deeply in the promise of America. They spoke proudly of leading happy, productive lives and having children and grandchildren living the American Dream, with good jobs, nice homes, and successful families. Ronald E. Randall Sr., outside of Jackson and Johnson Memorial Post 263 during the Ravens game. But their sense of patriotism and reverence for the nation’s symbols are complicated by the persistent realities of being black. They salute the American flag that flies in front of their stucco-faced hall. They rise for the national anthem. But they also know firsthand that their allegiance to the flag has not always protected their rights. For them, the national anthem can come across as both a song of soaring inspiration and a hollow tune. 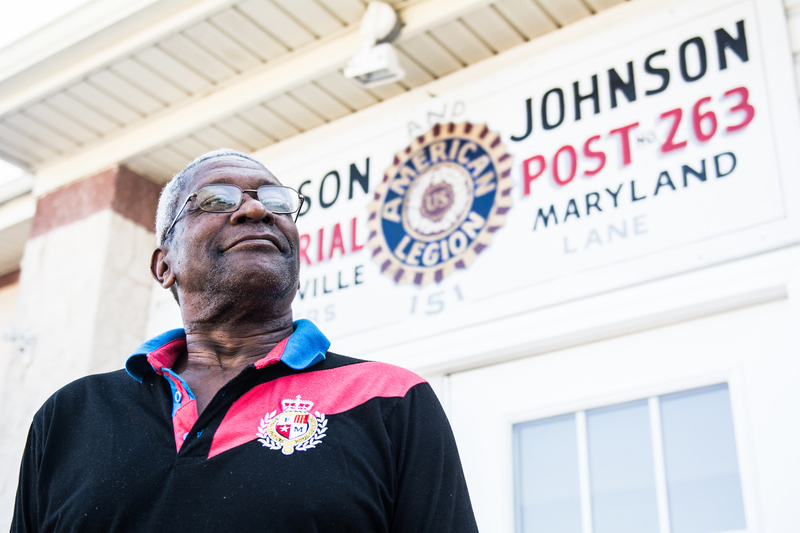 Ronald E. Randall Sr., 69, a retired school custodian whose father and brother served in the Navy, grew up not far from the legion hall in an enclave that has been all black since just after Emancipation. As a kid, he was barred from the white-only swimming pools during Baltimore’s sweltering summers. His mother could not shop along the local commercial strip. That was for whites only, too. He was in junior high when the public schools were integrated, and he remembers he and his black friends having to brawl with insult-hurling white students before they were left alone. Legal segregation was struck from the books more than six decades ago, but the stretch of wood-frame homes in the neighborhood, now known as the Winters Lane Historic District, remains overwhelmingly black. Economics, it turns out, is as effective as the law when it comes to limiting mobility. Homes just a few blocks away in mostly white Catonsville sell for at least double the cost of those on Winters Lane. They rise for the national anthem. But they also know firsthand that their allegiance to the flag has not always protected their rights. Smith remembers family members telling stories from when housing segregation in Baltimore was enforced not just by compliant real estate agents, but also by the fists and bricks of whites who could not countenance black neighbors. Consuella Rheubottom, 77, who has two sons who served in the Army, tends bar at the hall. Fewer than a dozen people are in the dimly lit bar, a couple are playing on slot machines and others sit on their stools, watching the game on two flat screens. Rheubottom said she felt some discomfort with the anthem protests. Yet, she felt repulsed — and scrambled to turn her television off — when she heard Trump insulting the players who chose to demonstrate. Edward Neal, 85, a retired laboratory technician wearing a Ravens cap, slowly settled into a corner stool in the hall’s bar as conversation about the protests wore on. It was not long before he joined in. 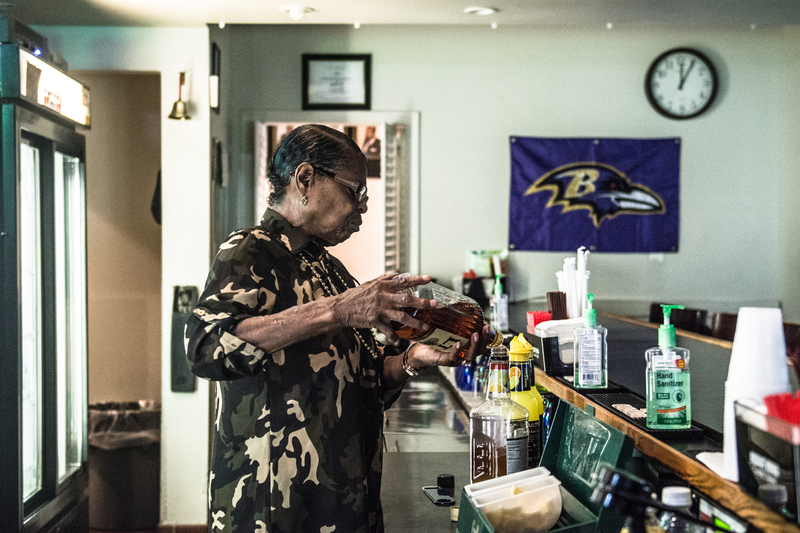 Consuella Rheubottom makes whiskey sours at Jackson and Johnson Memorial Post 263 during the Ravens game. He has mixed feelings about it all, he said. Neal agreed that the protesters have a point. While race relations have improved during his lifetime, he said, there is still is a long way to go to achieve equality. At the same time, he has deep respect for those who choose to serve in the military, because has seen the physical costs of war up close. Serving as a medical corpsman during the Korean War, he helped treat troops with severed limbs and horrific burns. That kind of sacrifice, he said, should always be respected. The anthem protests can lead people to think that the sacrifice is not being honored, he said. He added that teams should stand together. Unity is tested when some kneel and others stand for the anthem. And issues of social justice, he argued, are best debated in the halls of government and the courts.